Thank you for your response to my questions about both of my FLF plants! 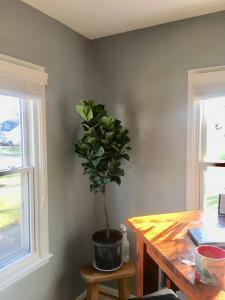 The FLF “Little Fiddle” tree I have is still in the plastic pot that it came in from the greenhouse, and I’m wondering if I should repot it, or just let it be? If I should repot, what is the best way to go about doing it? Thank you for your question! I would certainly repot the fiddle leaf fig from its original container. Follow the steps in this post to repot it.